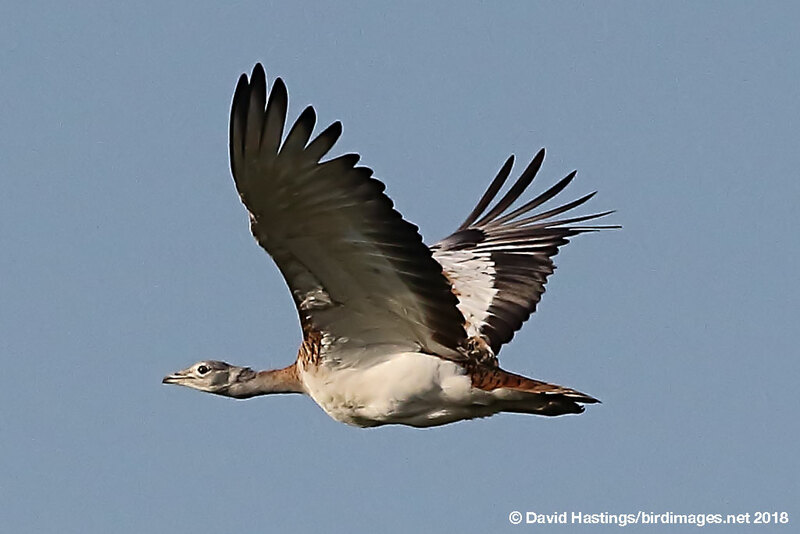 Great Bustard (Otis tarda). Male. Taken at Extremadura, Spain, on November 13th 2018. Male. Taken at Extremadura, Spain, on November 13th 2018. L: 90 - 105 cm; WS: 210 - 240 cm (male). L: 75 - 85 cm; WS: 170 - 190 cm (female). A large, strongly build bird with a heavy chest. A large male can weigh 16kg; females are much smaller and lighter. The wings are long, with deep winglets. The adult male is brown above, barred with blackish colouration, and white below, with a long grey neck and head. It is mainly found on the Iberian peninsula, with some populations in eastern Europe. Resident in the UK until 1832, it has been re-introduced on Salisbury Plain, although numbers are small. Its breeding habitat is grassland or natural steppe, defined by open, flat or somewhat rolling landscapes. The species is gregarious, especially in winter when gatherings of several dozen birds may occur. Male and female groups do not mix outside the breeding season. It is classified as Vulnerable by the IUCN.